Cricket Depth: Ian proved me wrong. Despite being out for four in his most recent innings, Ian Bell has 368 runs at an average of 61.33 and a strike rate of 81.77 in ODIs this summer. 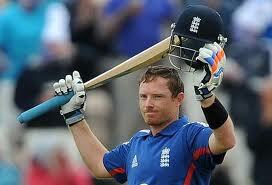 Let me just say, I was 100% against Ian Bell being Kevin Pietersen's replacement at the top of the order. You could accuse me of having a long memory, but my enduring image of Ian Bell opening in ODI cricket was him advancing down the wicket and continually blocking half-volleys to fielders. Last summer, he played some tortuous innings in the middle order where he just could not get the ball off the square. England have always struggled to find an opening batsmen who could hit over the in-field since Marcus Trescothick, so the selection of Bell, who sets more in store by timing and placement, expressed a change in attitude by the selectors. The concern has always been that Bell does not score quickly enough, but he dispelled those claims with a superb 126 off 117 balls in his first innings. This innings was really his coming-of-age in ODIs and maybe the first time I appreciated how good a player he is.His strike rate has dipped since, but he has scored consistently well and the team has won, which is the main thing. I am still not fully convinced about Bell's position, but as an England supporter I hope that he keeps proving me wrong.